Chapter Ten — Love in the Heart of the Church — My Catholic Life! Lesson: On September 13, 1896, Sister Marie of the Sacred Heart (Thérèse’s sister), wrote to Sister Thérèse asking her for a short note that expressed the secrets of her heart—the secrets God had confided to her. “The secrets of Jesus to Thérèse are sweet, and I would like to hear about them once again.” That night, Sister Thérèse wrote a beautiful note to Sister Marie and included a reflection she had written five days earlier, September 8, the day after Sister Thérèse had begun a ten-day retreat. This letter and her enclosed reflection make up the last chapter of the Story of a Soul. Upon reading these pages, Sister Marie wrote back to Sister Thérèse expressing her gratitude and awe. Oh! I wanted to cry when I read these lines that are not from earth but an echo from the Heart of God…Do you want me to tell you? Well, you are possessed by God, but what is called…absolutely possessed, just as the wicked are possessed by the devil. Sister Marie went on to say, “I would like to be possessed, too, by good Jesus. However, I love you so much that I rejoice when seeing you are more privileged than I am.” Upon reading these words, Sister Thérèse wrote back to her sister. The love shared by these two sisters was quite profound. They each deeply desired that the other know Jesus and allow herself to be deeply loved by Him, consumed by Him and possessed by Him. Each sister desired it more for the other than for herself. They admired each other, encouraged each other, shared their hearts with each other and were deeply united with each other. Their love for each other was only possible as a result of their shared love for and union with Jesus. Recall that the first eight chapters of Story of a Soul were written at the request of Sister Marie who asked Mother Agnes of Jesus to order Sister Thérèse to write her childhood memories so they could enjoy them. Chapter 10’s reflections are the fruit of the love of these two sisters. Reflection: When you think of those whom you love, what is your desire for them? Is it riches, worldly success, popularity, or is it that they become consumed and even possessed by God? The greatest love we can have for others is that they are perfectly united to God. Ponder the affectionate words shared between these sisters, and then ponder the relationships in your life. The love they shared is a perfect example of the love we must all strive to obtain for each other. Dearest Saint Thérèse, your love for your sister Marie was a love that desired her perfect union with God. She, in turn, desired your perfect union with God and was grateful for the beauty of your soul. Pray for me, that I may seek this love in every relationship I have. May I desire this greatest good for everyone I know and do all I can to help all those in my life on their ways toward holiness. Saint Thérèse, pray for us. Lesson: Sister Thérèse thirsted for Jesus with a burning thirst. She longed to love her Lord with every fiber of her being. To her, everything about Him was like a sweet fragrance, drawing her closer to her Beloved. She pondered the many stories in Scripture that taught her how to come to Jesus. She reflected upon the Publican who hid his face and cried for mercy. She reflected upon the Apostles who answered the call with haste. She reflected upon Mary who sat at the feet of Jesus, adoring Him with love. And she reflected upon the great sinners, such as the woman caught in adultery and the woman at the well. In all of these figures and in the many other passages of the Scriptures, Sister Thérèse learned how to run to Jesus and love Him as her Beloved. These Scriptures provided her with the scent of her Beloved, and she breathed in that scent deeply. She also discovered something that drew her ever closer to her divine King. She discovered that He thirsted for her! For example, when she thought about the woman at the well, she understood that when Jesus asked her for a drink, He was speaking about a thirst He had for her soul. These reflections led her to deepen her resolve to live out the Little Way that she had embraced as her quickest and easiest way to Heaven. How could her Beloved refuse her if He desired her so deeply? If she simply ran to Him, pursued Him and sought to quench His thirst for her, He could not resist her. Dearest Mother, if weak and imperfect souls like mine felt what I feel, none would despair of reaching the summit of the Mountain of Love, since Jesus does not ask for great deeds, but only for gratitude and self-surrender. Sister Thérèse was filled with gratitude and love for her Savior. It was this unshakeable confidence that enabled her to know with certitude that even if she committed all the sins in the world, those sins “would disappear in an instant, even as a drop of water cast into a flaming furnace.” She knew that if she, or any sinner on Earth, ran to the arms of the Savior, He would not resist His beloved’s love. Reflection: How much confidence do you have in God’s mercy? Our confidence should never be in our own goodness or merit. Sister Thérèse understood this well. Our confidence must be in God and God alone. His mercy is so great that nothing can keep us from Him if we allow Him to draw us to Himself. Reflect upon your own life and especially your sin. As you do, consider that sin to be like a single drop of water falling into the most ferocious and blazing furnace of God’s love. Whatever it is that you feel keeps you from Jesus, let it be consumed by His infinite mercy. God’s love can consume the most grievous sin. Seek to understand and live this Little Way of Saint Thérèse and you will find yourself delighting in the sweet fragrance of His mercy, leading you to a deeper communion of love than you could imagine. Dearest Saint Thérèse, your love for your Beloved is only outdone by His love for you. Pray for me, that I may grow in confidence in the mercy of God and that I may allow His mercy to transform my soul, so that I can love Him with all that I am. May nothing keep me from His love—no sin, no weakness, no fault. May I learn to live the Little Way of love that you discovered, so that I may be one with Him Who loves me so dearly. Saint Thérèse, pray for us. Lesson: During the final years of Sister Thérèse’s life, she endured a deep darkness in which she loved Jesus with the deepest love but could not sense the reality of Heaven. This darkness was a gift given by God to draw her ever closer to Him through profound acts of faith, hope and love. In the midst of this darkness, God gave her a special consolation one night that helped pierce the dark night she was experiencing. She had a dream about the foundress of her Carmelite community in Lisieux, Venerable Mother Anne of Jesus. Up until this time, she had little devotion to Mother Anne and knew very little about her. But in her inspired dream, Mother Anne came to Sister Thérèse and reassured her twice that God was pleased with her. The countenance on Mother Anne’s face was radiant, and her motherly assurance to Sister Thérèse was transforming. She reassured her that “The Good God asks no more of you, He is pleased, quite pleased.” Then Sister Thérèse awoke. This dream helped Sister Thérèse to penetrate the dark veil that hid from her the reality of Heaven. Heaven was real! And in Heaven, there are countless souls, such as Mother Anne of Jesus, who loved her and looked forward to her joining them soon in their Father’s House. Reflection: At times, God hides the mysteries of Heaven from us for our own good, to strengthen us in our faith and love of Him. Do you feel as though God is distant at times? If so, do not be discouraged. Instead, seek to deepen your love and make constant acts of faith in Him. As you do so, know that He is purifying you and helping you to grow in virtue. When God does give some consolation to you or some insight into His mercy, remember it, cherish it and cling to it. Sister Thérèse savored this dream for the rest of her life, especially when she suffered. Her remembrance of this encounter deepened her trust in God and her hope in Heaven. Today, that hope is fully realized for her and the veil of darkness will never cloud her vision again. 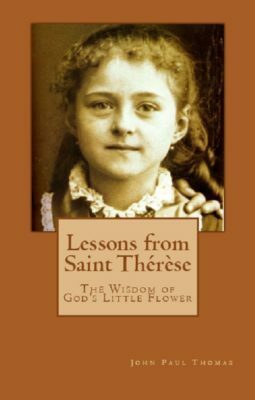 Dearest Saint Thérèse, you were given this deeply consoling dream as a lesson about Heaven. You clung to this lesson, pondered its meaning and allowed your memory of it to be a source of inspiration for the rest of your earthly life. Pray for me, that in times of darkness and confusion I will remember the sweet consolations God has given me, so that I will persevere through all things so as to one day enjoy the full vision of Heaven forever. Saint Thérèse, pray for us. Lesson: Sister Thérèse discovered within herself an infinite longing to love God in countless ways. She loved her vocation as a Carmelite nun but also saw great beauty in every vocation within the Church. In her longing, she couldn’t shake the desire to embrace every vocation of every time. To be Thy Spouse, O my Jesus, to be a daughter of Carmel, and by my union with Thee to be the mother of souls, should not all this content me? And yet other vocations make themselves felt—I feel called to the Priesthood and to the Apostolate—I would be a Martyr, a Doctor of the Church. I should like to accomplish the most heroic deeds—the spirit of the Crusader burns within me, and I long to die on the field of battle in defense of Holy Church. She went on to ponder the great martyrs such as St. Bartholomew who was flayed alive for love of God, Saint John who was plunged into boiling oil, St. Ignatius of Antioch who was ground by the teeth of wild beasts, and St. Agnes and St. Cecilia who offered their necks to the sword of the executioner. She also pondered her heroine of France, Saint Joan of Arc, who fought for the faith on the battlefield. And to be a priest! To offer the Holy Mass! She was overwhelmed with love of every vocation and desired them all. How could she fulfill these deep longings to love God in so many ways? Her answer was discovered as she read Saint Paul as he spoke about the Body of Christ, the Church. I knew that the Church has a heart, that this heart burns with love, and that it is love alone which gives life to its members. I knew that if this love were extinguished, the Apostles would no longer preach the Gospel, and the Martyrs would refuse to shed their blood. I understood that love embraces all vocations, that it is all things, and that it reaches out through all the ages, and to the uttermost limits of the earth, because it is eternal. Sister Thérèse discovered her sacred vocation. She was to be the heart of the Church. She was to be love. In being LOVE, by incarnating love, she would be a member of every person, embrace every vocation and live that which was the motivating force of every saint. Love was the answer, and love would be her vocation! Reflection: God gives each one of us a unique calling. We cannot accomplish every role and fulfill every need in a material way, but we can live the one central role of every vocation. We can live a vocation of love, for love is everything! By living love and by bringing more love into our world, we provide the fuel and heart of every vocation. What is your role in society and especially within the Church? Whatever your particular vocation may be, do you seek to live it with the greatest love possible? If so, you, like Saint Thérèse, will add to every vocation and will enliven the entire Church with the Heart of Christ. Reflect upon the universal call of every Christian to be the Heart of Christ in the midst of the Church. How you live the love in the Heart of Christ may differ from others, but it will be the same Heart and the same love lived by every saint of old, every living saint today and every saint who is to come. Dearest Saint Thérèse, you discovered your universal vocation to love. You understood well that you were called to be the Heart of Christ alive within the Church. By being His Heart, you were all things. Pray for me, that I may also discover this universal call to love. May I live love and be the Heart of Christ in the unique way I am called, and may I do so with great zeal and fervor all the days of my life. Saint Thérèse, pray for us. Lesson: Sister Thérèse had discovered her vocation. She was to be love in the heart of the Church and in being love, she was to be all things. But how was she to love? How could she attain this high calling? Sister Thérèse was keenly aware of her littleness and weakness, yet she was also aware of her desire to aspire to the greatest heights of love! How can a soul so imperfect as mine aspire to the plenitude of Love? What is the key of this mystery? O my only Friend, why dost Thou not reserve these infinite longings to lofty souls, to the eagles that soar in the heights? Alas! I am but a poor little unfledged bird. I am not an eagle, I have but the eagle’s eyes and heart! Yet, notwithstanding my exceeding littleness, I dare to gaze upon the Divine Sun of Love, and I burn to dart upwards unto Him! I would fly, I would imitate the eagles; but all that I can do is to lift up my little wings—it is beyond my feeble power to soar. Her prayer and her ponderings led her to realize that the key to the fulfillment of her calling of love was indeed to remain little, a little bird. She would fix her eyes on Heaven and gaze at the Divine Sun of Love. She would be a willing participant in love, but she also knew that she was incapable of this high calling by herself. Therefore, it was her hope that God’s love would accept her as a “victim.” She would “count on the aid of Angels and Saints” and would keep her eyes fixed upon Jesus, so that she would become His prey, “Love’s prey.” She longed to have her Divine Eagle “swoop down” and bear her away “to the Source of all Love.” The Divine Eagle had already descended to Earth, He remains here in the Sacred Host, but He also re-ascends to Heaven. She would love Him and become His prey, His victim of love, and thus ascend with Him by His strength alone. This was her only chance of fulfilling such a glorious call to love. This was her prayer for all who sought to live such a lofty vocation of LOVE. I ENTREAT THEE TO LET THY DIVINE EYES REST UPON A VAST NUMBER OF LITTLE SOULS, I ENTREAT THEE TO CHOOSE, IN THIS WORLD, A LEGION OF LITTLE VICTIMS OF THY LOVE. Reflection: The depth and beauty of Sister Thérèse’s discovery was awe-inspiring. She understood victimhood in a new way and understood that it was only in being a martyr for love, a victim of love, that she could attain the calling she received. Ponder these deep insights from this little saint of God. Reflect upon her joy and enthusiasm at the discovery of her profound calling. Realize that God is calling you to the heights of greatness, but that you cannot attain this on your own. You can only allow yourself to become love’s victim. In doing so, our great God will seize you in His love and take you to the glory to which He has called you. He will especially do this through your consumption of the Most Holy Eucharist. Your duty is to say “Yes” and to gaze at Him in joyful anticipation of Him accepting your life as a sacrifice, a holocaust of love. If this language is new to you, ponder it over and over. Pray to Saint Thérèse and ask her to teach you her Little Way of love. Seek to understand and surrender yourself to this quickest and easiest way toward the fulfillment of the vocation to which you have been called. Become a Victim of Divine Love, an offering pleasing to our Divine Lord. 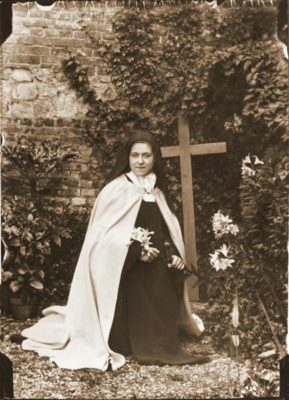 Dearest Saint Thérèse, you offered yourself to Jesus with the utmost confidence in His mercy. You were little, weak and incapable of attaining the high calling of love to which you were called. Yet you knew that if you offered yourself as a martyr, a victim, God would receive you and take you to the glory of Heaven. Pray for me, that I may discover this Little Way of love. May I also become love’s victim and, in this act, achieve the fulfillment of the vocation to which I am called. Saint Thérèse, pray for us.